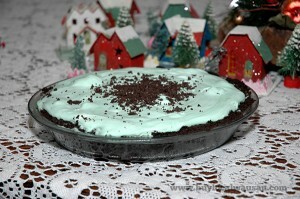 What says Christmas Holidays more than a cool, creamy Grasshopper Pie? As a kid, we would visit my grandparents every Christmas Day. 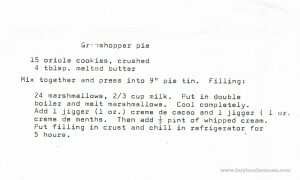 It was a given that after dinner you would have a choice of two different pies, grasshopper and mince meat. 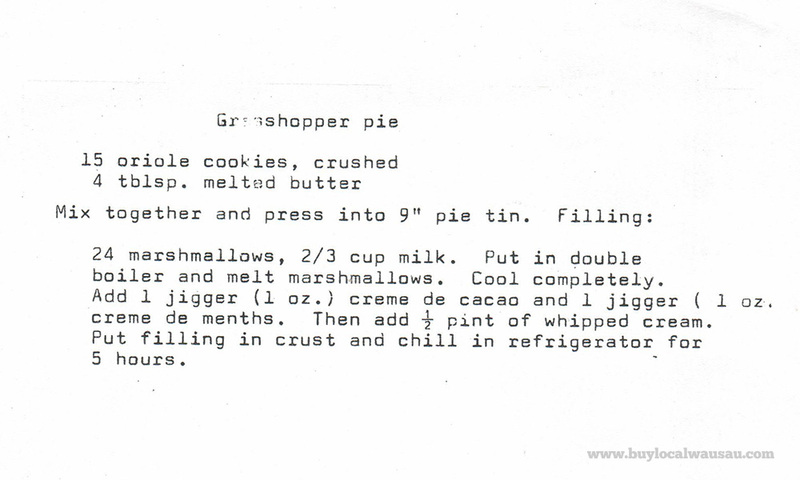 Of course the popular favorite was the grasshopper pie. No one really knows when the holiday tradition started, but I’m pretty sure that in reading the recipe, that my grandmother cribbed the dessert from a Dekuyper Creme de Menthe ad from the 1960’s. 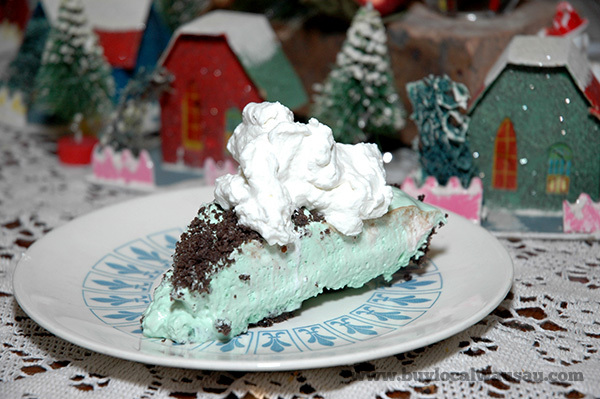 The pie is light and fluffy, and deliciously minty. 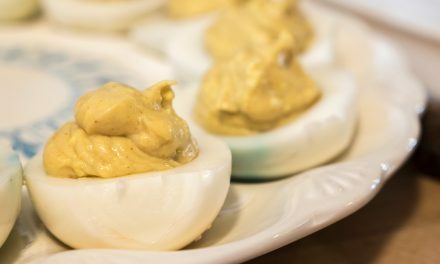 it’s the perfect dessert for a big Christmas dinner. Plus it’s super easy to do. The biggest investment is buying the Creme de Menthe and Creme de Cacao, but if you only make one pie a year, those two bottles will last you 10 years or more. My grandparents weren’t much for drinking, so I’m sure her two bottles were 60’s vintage also. 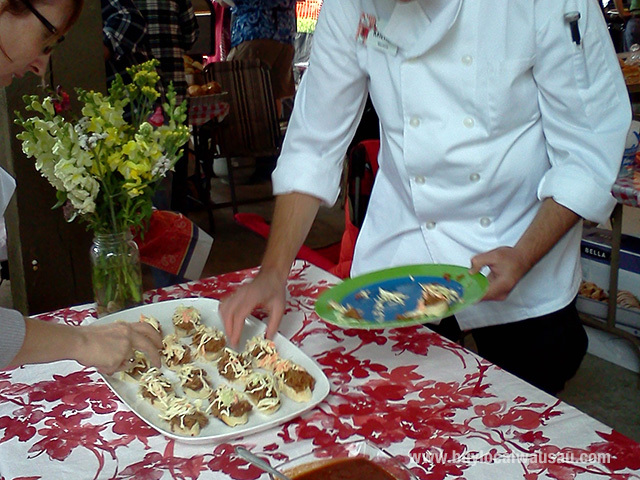 Click to read the original 3×5 recipe card. Crush Oreo cookies to a fine crumb (a food processor with a large work bowl works well for this). Add melted butter to crumb. Press into a 9 inch pie plate, reserving 1 tbsp to decorate top of pie. Bake in a 350 degree oven for 15 minute. Allow to cool. Put marshmallows and milk into double boiler and melt marshmallows. Allow to cool completely. Stir in Creme de Menthe and Creme de Cacao. Fold in whipped topping. Put filling into crust and chill for 5 hours.